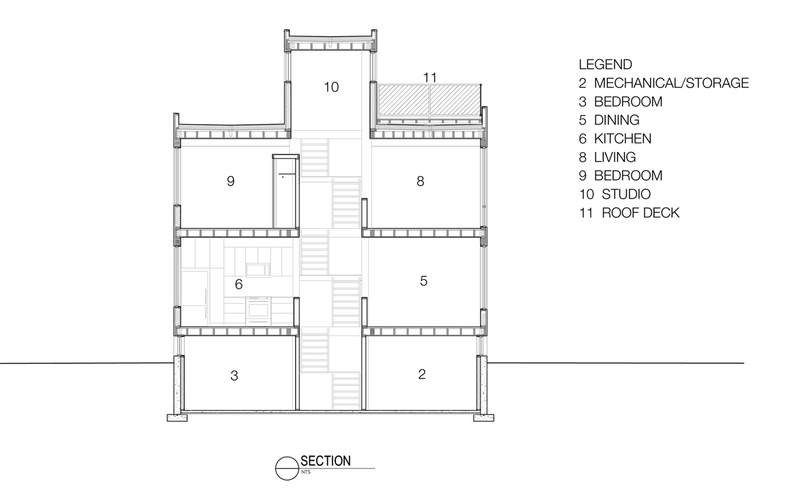 Architects: Colizza Bruni Architecture Inc. 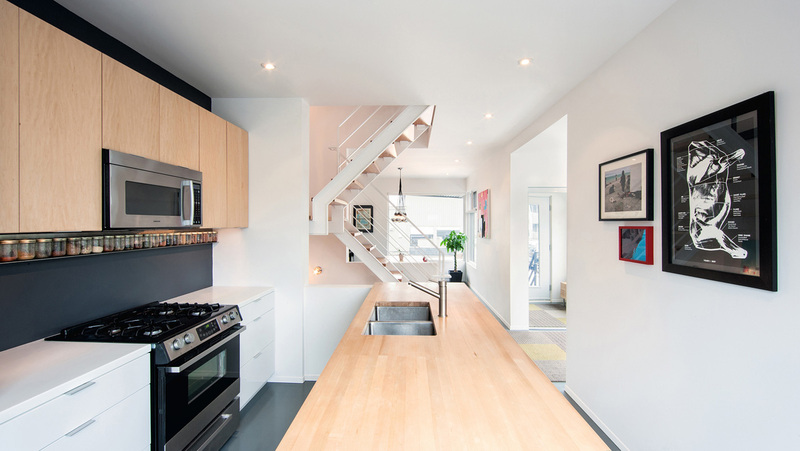 The residential infill development of THE HINTONBURG SIX is an example of looking back at the history of a place in order to be informed on how to move forward in the present. 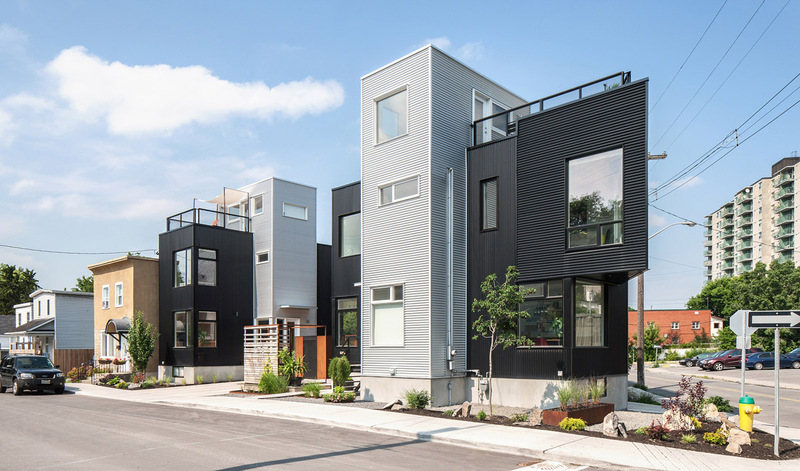 THE HINTONBURG SIX also illustrates how the three levels of design; that is, urban, architecture and landscape, can and should exist in a symbiotic manner. The Village of Hintonburg was established in 1893 and annexed to the City of Ottawa in 1907. At the time Hintonburg was regarded as Ottawa’s first ‘industrial suburb.’ French and English immigrants were attracted to the area because of its affordable housing and proximity to the mills and railyards where many of Hintonburg’s inhabitants worked. This was very much a working man’s neighbourhood. 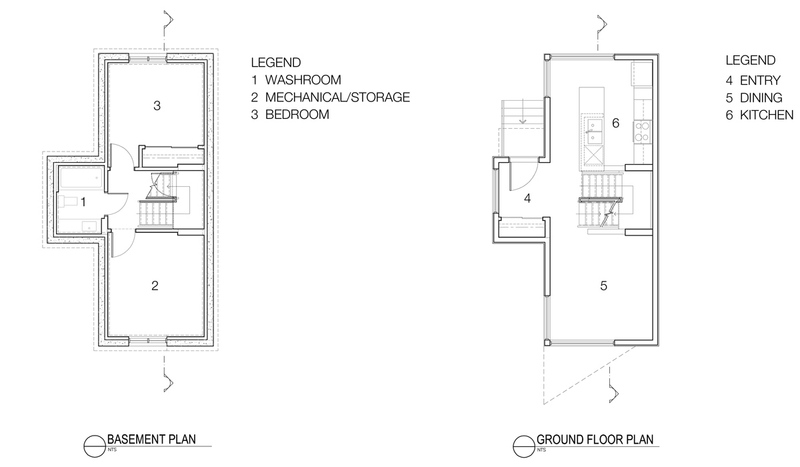 Affordability was achieved by building one’s own home which was small and simple. 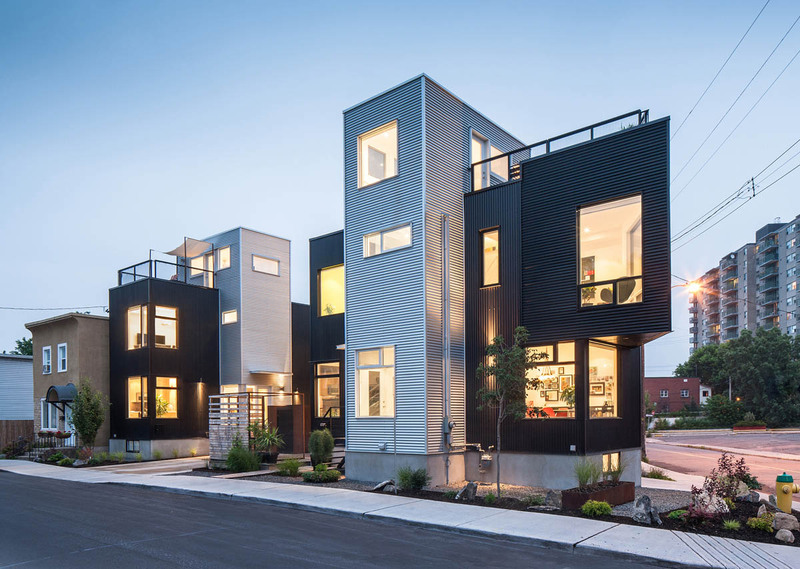 The character of Hintonburg’s streets was the result of building 2 storey homes close to the street and each other. The scale of the street space was casual, intimate and animated by porches and stoops. Street landscaping was spartan at best due to the proximity of the house to the sidewalk. 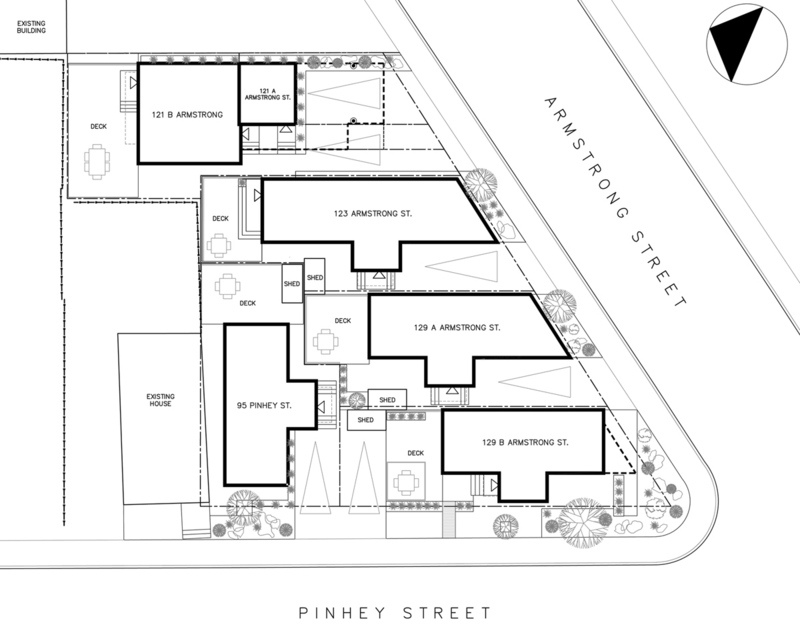 The development at the corner of Armstrong Street and Pinhey Street consists of 6 new homes. The four detached and one semi-detached buildings replace a former single detached dwelling and garage which occupied the 600 m2 lot. 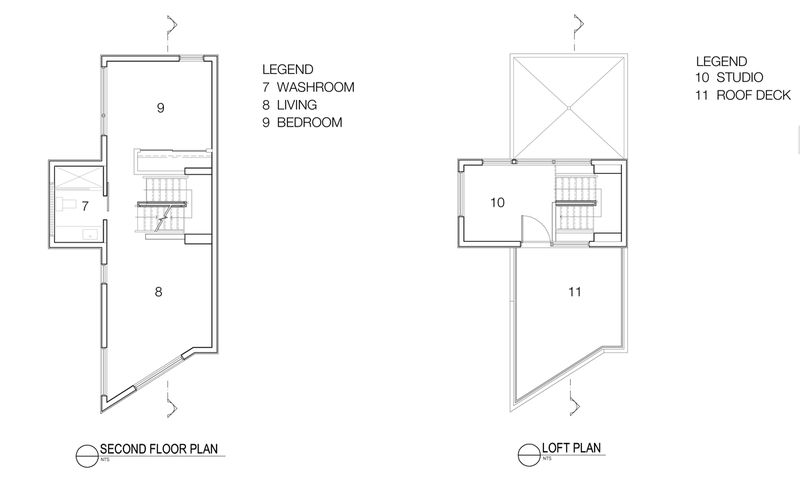 Each home is approximately 100 m2 and is built on a 100 m2 lot. 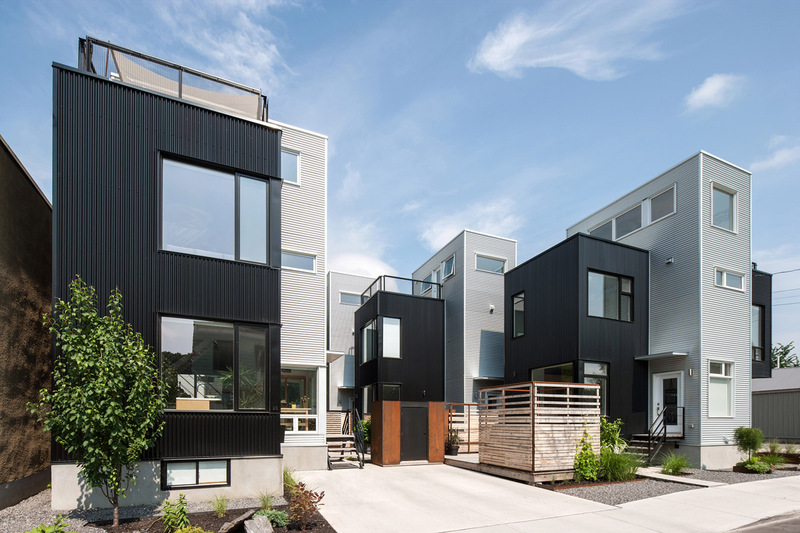 The buildings are 2 storeys, with a partial third storey; each has an at-grade as well as a rooftop amenity space, one parking space and is clad in metal siding. 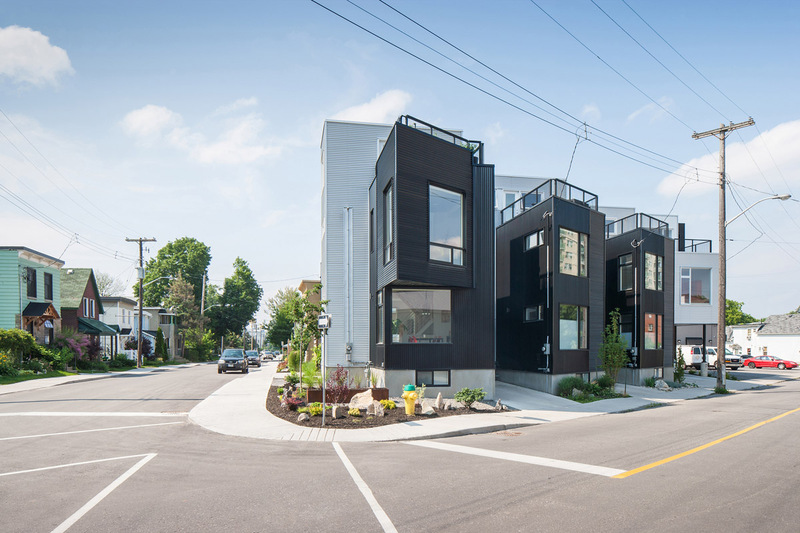 At the URBAN DESIGN level, taking cues from the historical built form of Hintonburg, the buildings of THE HINTONBURG SIX are located in close proximity to the street and each other. They are two storeys in height and smallish in scale and massing. The car is comfortably located in the overall site composition… it is accommodated but not overbearing. 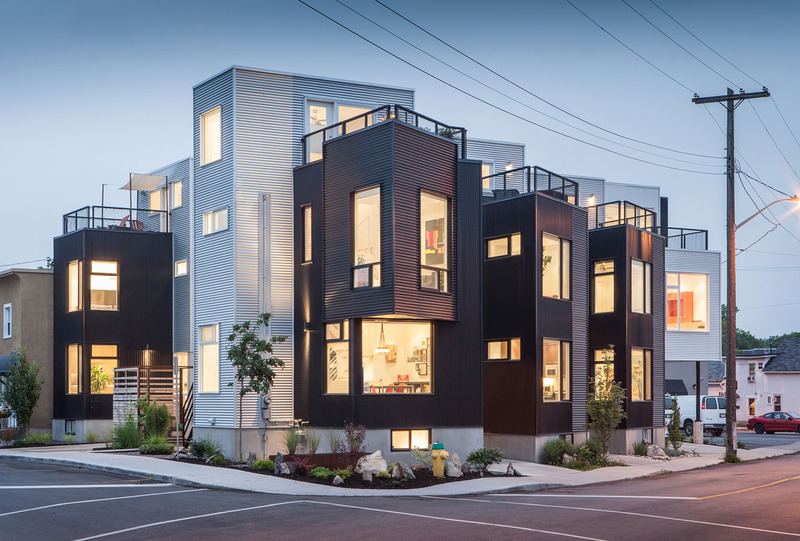 LANDSCAPE DESIGN level, the landscaping at the street is not generous but does soften the ground plane at the interface of the buildings and sidewalk. 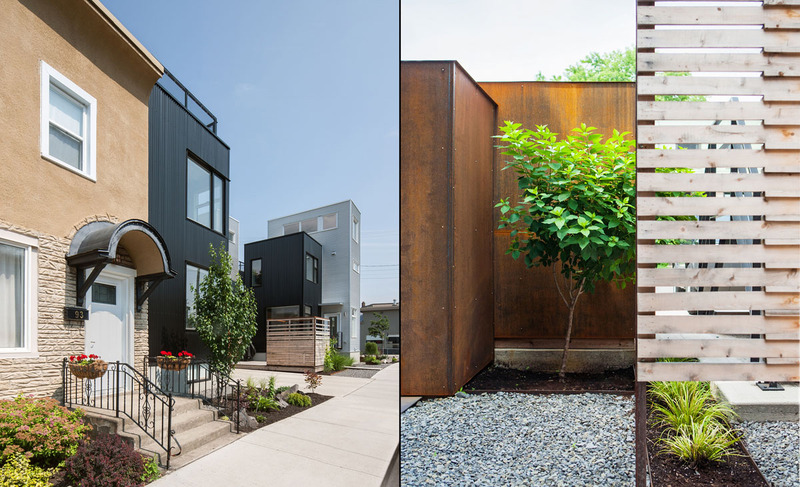 The combination of rock from the site excavation, shrubs, trees, gravel and steel planter boxes reinforces the notion of collage evident in the architecture. Private amenity spaces are defined by storage sheds clad in steel sheets, steel frames and cedar slats. This ‘fencing’ strategy is permeable as it allows light and air to flow between outdoor spaces. Unexpected glimpses of trees, plants, sheds and outdoor furniture are revealed through the cedar slats. 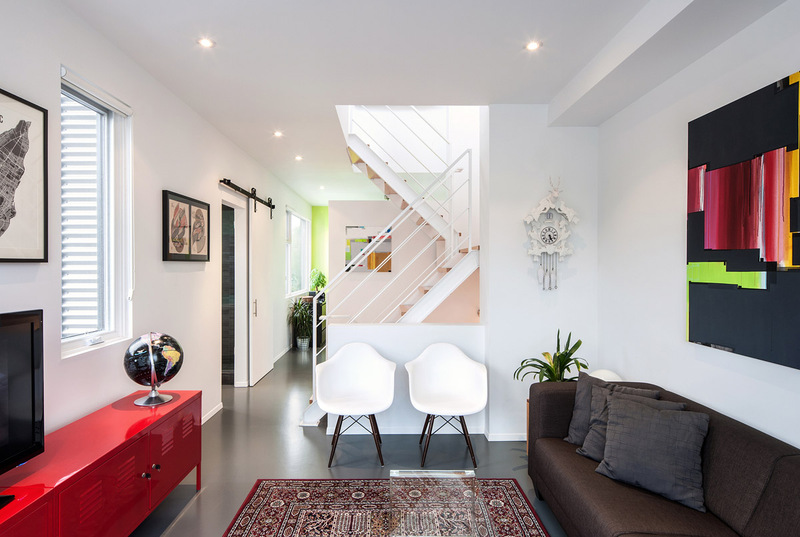 At the ARCHITECTURAL level, the design can best be described as a collage of colours, forms and textures. 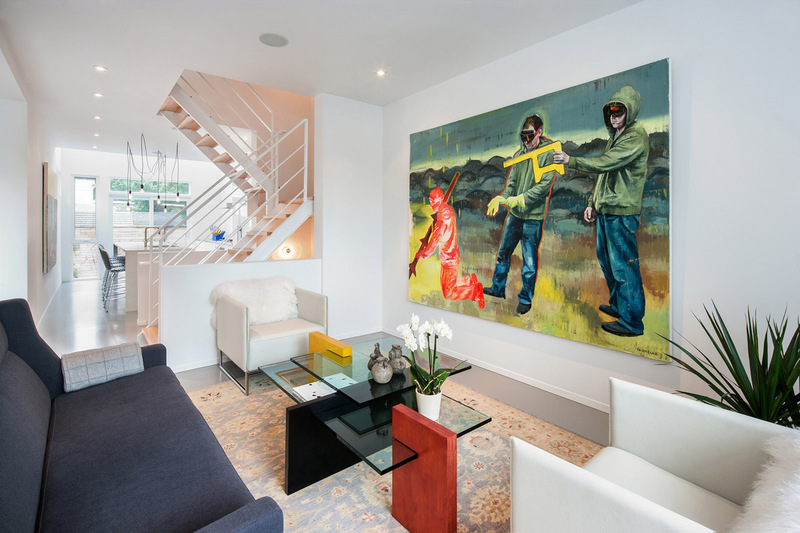 Building and landscape materials make reference back to the industrial heritage of the area. 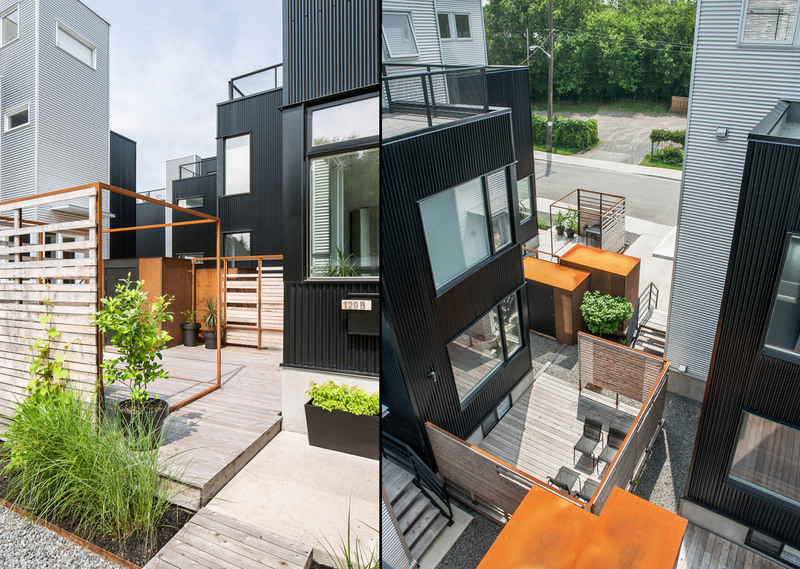 Walking along Armstrong or Pinhey Street, the pedestrian experiences a series of overlapping and fragmented surfaces: painted black and galvalume metal siding, expansive glass, orange rusted steel, natural wood. The overall composition is dynamic as opposed to static. In this way, the eye is stimulated and engaged. The street walking experience is further animated by the ‘stuff’ of everyday living seen through the expansive windows: furniture, plants, artwork and inhabitants.